Annual Plants. Annual Flowers. Annuals. Winter Flowers. Biennials, Perennials. True Annual Plants Die Right Back After Winter. Then We Begin Again In Spring. Perfectly Planned Garden Of Perennials With Annual Flowers Filling the Gaps. 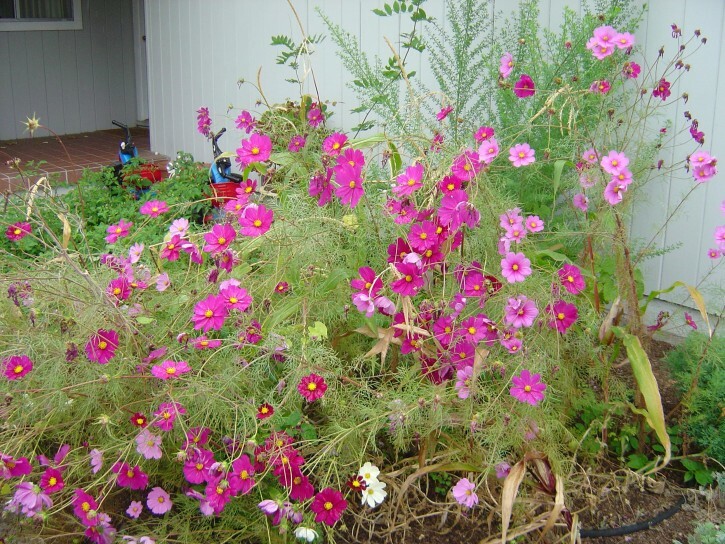 From the late Col Campbell (Gardening Australia) about annual plants: "Botanically speaking, annuals are plants that germinate, flower and die in one year. Of course, that puts most vegetables in the same category, but when we refer to annuals, it’s usually about flowering ornamental varieties – the ones we use to drag our gardens out of the winter doldrums and remind us that spring is really here". True annual plants die right back after their flowering cycle finishes and they have served their purpose ie. they have produced seeds for the next generation, and are unable to live beneath the ground until the next spring - unlike the bulbs. Some examples of Annuals are Pansies, Asters, Delphiniums, Poppies, Snapdragons and Carnations. Some of these annuals can be planted earlier than I ever thought possible. 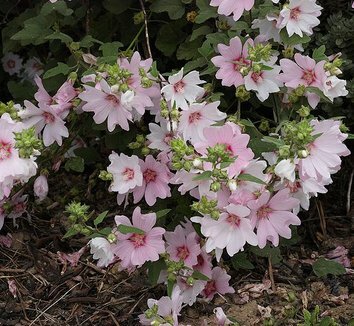 See Hardy Annuals and more about Annuals to Plant in Spring on the Names of Spring Flowers page. Note: in the centre of the above photo, you can see the beautifully integrated silver-grey of the Dusty Miller plant which is actually a member of the Daisy family. It is used in garden design to show off annuals and perennials in some very beautiful gardens. List of Pages About Annual and Perennial Plants. Perfect Colour Complements. Red Begonias, Violets and Yellow Coneflowers. Scroll down to see a list of all my favourite Annual Plants, and also Annuals you can grow in Australia as well as great Winter Flowers for Australia. If you love Petunias and it's too cold to grow them, then the amazing new hybrid is for you. It's called 'Below Zero' and has finally arrived after ten years of experiments. If you are looking for Winter Flowering Plants and those for Australia, they are now on their own page. Winter Blooming Plants. Bulbs come in various forms (true bulbs, corms, rhizomes, tubers and tuberous roots) and begin to grow by themselves after winter because their underground storage systems contain all the food they need for the winter. They are some of the showiest plants of all in spring and summer and even autumn. While bulbs are really perennials because they stay underground for the winter, they are always our 'annual' delight which we look forward to every year. Read about bulbs and other clever ways of getting through the Winter. Biennials have another type of cycle. They complete their whole life cycle in two years. The first year is devoted to growing the stems, roots and leaves, and then the flowers and seeds appear and develop in the second year. That's amazing. Examples of biennials are: Hollyhocks, Foxgloves, Forget-Me-Nots, Campanulas, Dianthus, some Poppies and Salvias (and many vegetables). 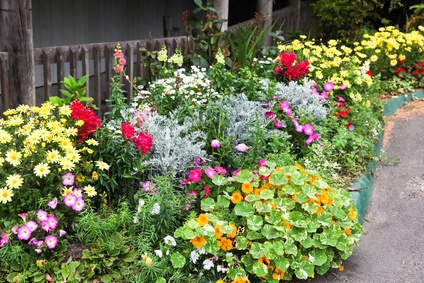 If you plant them at just the right time you can have some annuals flowering in each season, each taking their turn. So many types of flowers overlap with definitions depending on where you get your information, so unless you have to be 'specific' for study purposes, it's fine to call a biennial an annual and vice versa. Hollyhocks, for instance, are often called annuals and perennials but most are really biennials. Delphiniums are a type of Ranunculus which may grow as an Annual Plant, a biennial or a Perennial. The Chinese Delphinium (Delphinium Grandiflorum) is a biennial. Nasturtiums. Cheerful and delicious Herbaceous Plants. Herbaceous Plants are often confused with true annuals. Herbaceous plants, as opposed to woody plants, have soft stems and leaves and die down to ground level - but no further - during the colder months. Annual Herbaceous Plants are those which include all the true annual plants which we have to plant again each year from seed. They die completely each year after flowering and must be regrown from seed once more. These are the ones which gives us so much joy in the winter - as we pore over the seed catalogues once more. Love it! Some of these are the Aster, Zinnia, Calendula, California Poppy, Swan River Daisy or Brachyscome (an Australian Native) and the Larkspur (Delphinium), although this also has perennial forms. 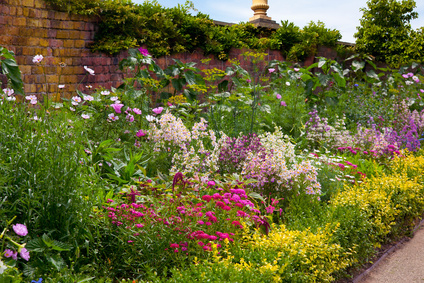 A Walled Garden With A Traditional English Herbaceous Border. Many annual plants may be mistaken for perennials if they self seed and come up next year. We think they're still alive underground and have grown again for the spring or summer. 'All "annual" plants are "herbaceous," but not all herbaceous plants are annuals'. David Beaulieu. Many overseas visitors believe that the whole of Australia is hot and dry, and find it to be quite different after a visit or looking online. I have lived in several towns which are above 700 metres and had the joy of finding beautiful cold climate plants I had never seen. My first crocus was so amazing; it took me a long time to find out what it was. Cold climate annual plants can be found in such places as the Snowy Mountains, Braidwood (the loveliest town in the world), the Blue Mountains in NSW, along the Great Divide, Gippsland in Victoria, the Granite Belt of NSW/QLD famous for its fruit, and Toowoomba (The Garden City) which is set right on the edge of the Great Divide in Qld, and so many other places. 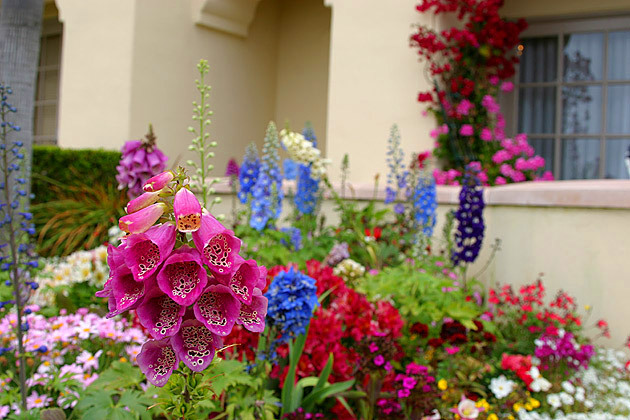 In these types of environments we can definitely grow the beautiful cottage garden annuals such as Hollyhocks, Delphiniums and Foxgloves to name but a few. 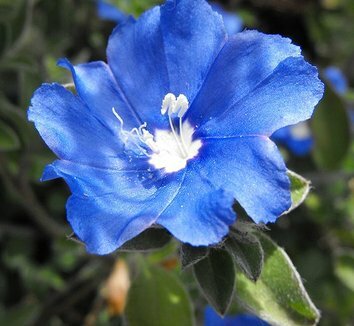 If you live in a cold climate in Australia, you will probably know which annuals you can grow, but if you have just moved there, you are in for a treat. When I lived in Braidwood (just SE of Canberra), I experienced my first real winter. Of course, I had visited the Snowy Mountains in winter to ski, but that's not 'living'. On our first real winter night the temperature went to -12 C and the horse troughs froze over. And one day it went no higher than 4C. I just couldn't get warm. So if you need plants which will flower during the cold months, just go to Winter Blooming Plants. There you will find plenty of flowers which will come up in very early spring, after the severest cold is over, and in winter itself if your winters are not too cold. The Annual Flower Festival at Toowoomba. Up on the Great Divide west of Brisbane, they are cold climate plants. A List Annual Plants. Common And Easy to Grow. This is a list of the Annual Plants I have grown and loved and which have proven easy to grow in Australia. So many of these are grown as Perennials in Australia, but in Northern climates, they may only be found annually. You can also see more about some of these plants on Names of Spring Flowers. 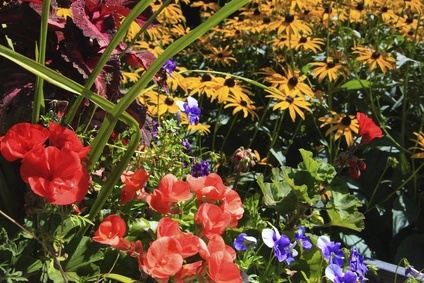 Don't forget to check out the List of Flower Names A to Z for both annuals and perennials. I've heard and read of Lemon Verbena in Victorian gardens, but had no idea there was a red! How beautiful. They are fragrant and as you can see they certainly don't mind a bit of dry weather. Most common are the purples. The following is a List of annual Plants which I have not grown, but I sure would like to. I know old-fashioned Pansies are lovely, but this one is certainly a stunner. Ruffled. Apparently, the colder the climate the more ruffles you get. I have crocheted one, but haven't seen one yet. Lovely. Plant now in spring for flowers in late summer, autumn and even winter, depending on where you live. 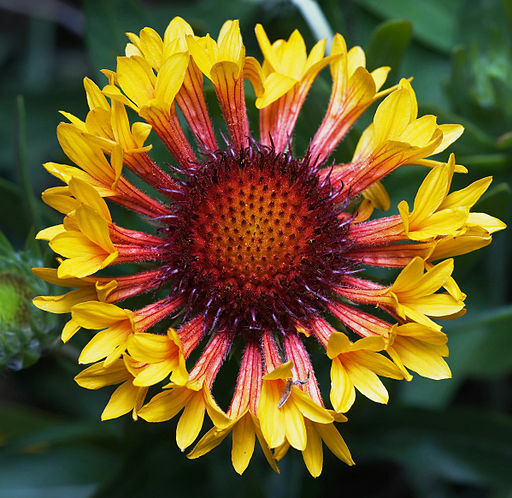 Gaillardia pulchello (the Blanket Flower) 'Red Bloom'. Which Annuals Bloom The Longest? Pansies are one of the longest blooming Annual Plants, adding colour to your garden from spring right up until the first frost. If you live in warmer climates, they will even bloom all year round. 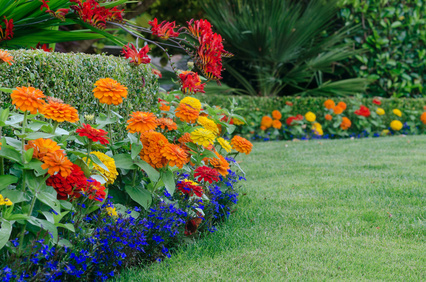 Other annuals with the same bloom period are Cosmos, Marigolds, Snapdragons, Ageratum, Dianthus, Impatiens and Petunias and so many more. If you are growing them by seed, sow them several weeks apart and you will be in for a continual show. Also, to squeeze every last flower out of your plants, be sure to deadhead them. Just like roses, this encourages growth in the flowers rather than in the stems and leaves. In Australia the bloom time is from spring to autumn and even longer. Once again, this depends on your climate zone. And to ensure that your flowers do bloom at their best, liquid fertilizer applied before they are due to flower for the first time in the season will reward you. This is vital if they are in pots. Our Heirloom Freesias this year - oh dear! Forgot the fertilizer and guess what? No perfume - they just smell like pepper. They are in a pot outside the door. It's amazing how many things we don't notice as we walk by. And if you want to read about how you can grow the best Spring Garden possible, find out on the Names of Spring Flowers page. These are what I call Annual Perennials - because they are definitely perennials but they flower for only one season of the year. The best example of this has got to be the Chrysanthemum (or Mothers' Day Flower in Australia). It flowers for only one season in autumn and that's it. It's leaves will remain, but we always cut them back. Another example is the Japanese Windflower. And another which bugs me because it only flowers for a few weeks: the Banksia Rose. A gorgeous but annoying rambler which is perfect to grow up through a plum tree. My plum flowers were white and the rose blossoms were yellow. The plum blossom lasted longer than it did. But would I pull out the rose because it didn't bloom long enough? Definitely not. Here in Australia we have so many perennials which flower many times over during the year. We don't have to wait long for these beauties. eg. the Plumbago bush. With its tiny pale blue flower clusters, it is the perfect shrub to fill in large gaps or to make a hedge. They even have a butterfly to match. A tiny blue one which looks like one of the flowers. My daughter had a large Plumbago in a butterfly garden - out of the wind - and they were a joy to see. Even in the sub-tropics where I live we still have to wait and wait for spring to bring us the flowering bulbs, and the annual plants which we plant from seed. What Could Be A More Stunning Colour For A Workhorse Plant. Evolvulus glomeratus. This is actually a perennial flower but it is so stunning I'm leaving it here. It is a wonderful ground cover - so exquisitely pretty - and the thing is it flowers for most of the year. It is an ideal edging and rockery plant and will set off your annual plants beautifully, quickly covering over the gap when they finish. Tough and versatile and always there. Although mine was very pale and nondescript. I had no idea back then that an Evolvulus could like like this! What a ground cover. Tuck your annuals in between these exquisite jewels. The Humble Cornflower Can Be Quite Striking. The Cornflower can be grown as an Annual or as a Perennial Flower, depending on where you live. If you are in a cold climate, this humble little plant would probably be considered a very tender annual. But if it self seeds, you might be lucky to find some in Spring. 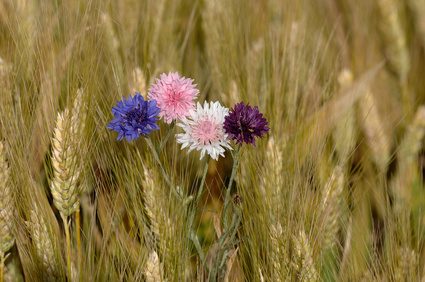 Otherwise known as Bachelor's Buttons, they come in blue (Centaurea cyanus), pink, white and a deep purple or lavender. I would never be without this gorgeous flower, even if I kept it in a pot which I have done many times. Ideally, annual plants should be chosen so that their flowering periods will happen in a cycle: when one finishes flowering, another begins. Beautiful colour schemes can be achieved using this method. Early spring, late spring, summer and then autumn and right into winter. This can be done by planting different seeds two to three weeks apart. They are still in the same planting and flowering seasons but they will flower at different times. As for keeping your seeds after you gather (or harvest) them from your own plants, keep them in paper bags and store in a cool environment away from light. Then they won't think it's time to grow. You don't want them to sprout, so don't get them wet or leave them in an area of high humidity. And if you want to know the secret of growing real old-fashioned Annuals like they do in England, the following book has taught me one thing, and for that one thing I thank Lisa Mason Ziegler: Sow your seeds earlier than even you thought possible. Just click on the picture to learn more about Growing Annuals Using Cool Weather Techniques. See all about this book which I have just finished. It has changed my life. Something drew me to this book and I'm sure glad it did. Cool Flowers Page. Note: This book is not just for the cut flower trade. It's for us. Not one bad review. Heirloom Annual Plants are simply any plants which are not new or modern - the ones we used to see at Grandma's house. They are old fashioned in the true meaning of the term. They have been passed down from generation to generation in order to keep their outstanding qualities. They are not polluted by any modern hybridizing, they keep their good old original colours and fragrance and in the case of fruits and vegetables, they retain their delicious taste. Some may be hundreds of years old, or they may even be from the 1900's. Naturally, they are usually grown organically for the best effect. If you begin collecting them, then you run the risk of becoming a real collector. I have friends who collect seeds and plants of this kind and they all say that it's certainly addictive. But what a wonderful thing to collect. My favourite Heirloom Annuals are the Cream Freesias. The modern ones just smell like pepper, but if you fertilize them just before flowering time, you should be able to get the true perfume, although nothing compares to the fragrance of a real Heirloom Freesia in bloom. It really is a good idea to have some Heirloom varieties amongst all your annual plants, just to keep in touch with the good old fashioned gardens. (Especially in the vegetable section where you will get the true flavour). If you are growing perennials as annuals, sometimes they will need cutting right back at the end of the growing season if they die back and look shabby, especially if they become frost-bitten. Three Types of Flowers. What Can Be Achieved With Only Zinnias, Crocosmia And Deepest Blue Lobelia. Beautiful. Colour Rules in the Late Winter to Early Spring Garden. 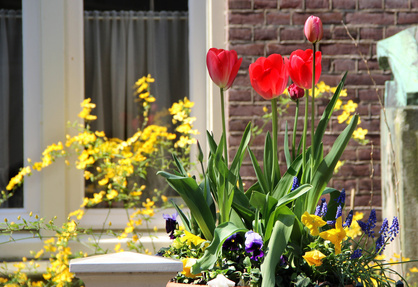 Forsythia with Tulips, Pansies, Daffodils and Grape Hyacinths. One of the prettiest mixes I've ever seen. And so simple ... How I would love to look out on that every morning. On my list. Such A Delicate Shade Of Pink. Lavetera. Portulacas Looking Like Roses. Drought Hardy Jewels. 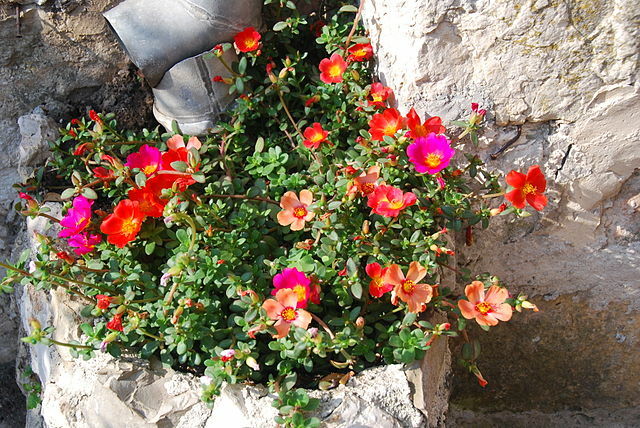 I love Portulacas. The singles. They look like buttercups and wild roses and they grow from the tiniest piece. Being succulents they can virtually grow on a rock! ﻿Photo Credit. Find Hundreds of Annuals and Perennials On My Pinterest Board. Return from Annual Plants to Home.